Storytelling is a hot topic right now in marketing and communications, as well as in politics, management, management, HR and many more fields. It’s a hot topic that can be approached with many different angles. Over the last years, we’ve studied quite a lot of these angles and as a result, we have articles about storytelling all over our blog. So we thought it might be useful to gather all our 13 articles on storytelling in a single place. For your convenience. No need to thank us, just read and have fun! 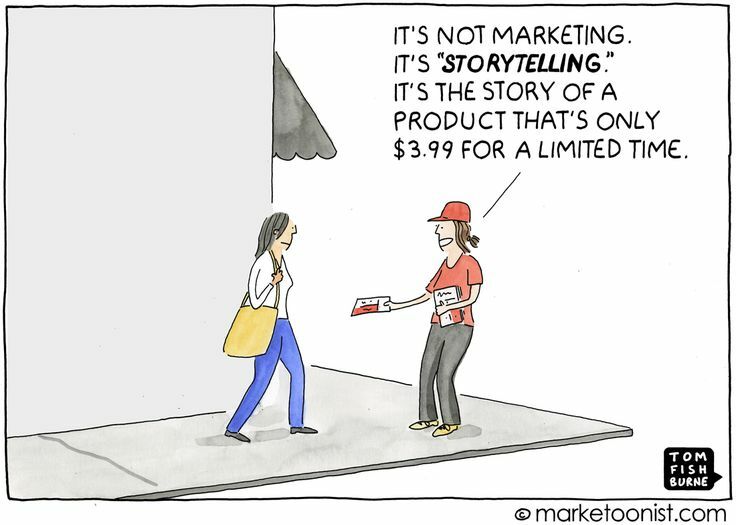 It's not marketing, it's storytelling. 1. What is business storytelling? For those who work in marketing or communications, storytelling is all around. In a few years, it’s become a big buzzword in our trade. But what is it exactly? Now that everyone is presenting themselves as a storyteller, here’s a crash course to catch up. What do recent events such as political campaigns, social media marketing, or the rise of TED Talks as pop culture components all have in common? They all leverage the power of storytelling. Before you try your hands on the new universal communication tool, here are a few facts that you might find of interest. 3. Corporate communications and storytelling: stop talking! All of us communication professionals love words. We just loooooove them. That’s what brought me to this job. But in a world where nonverbal communication plays a major role compared to words, we should take a moment to consider finding alternate ways to tell stories and carry messages. In several conversations together, our Service design specialist Daniele Catalanotto found out that good Service Design and good Storytelling actually have quite a lot in common. This article explores how, just as a good story needs hard times and failures, a good service needs emotional ups-and-downs to be memorable. Storytelling can create a big impact. That’s why we recommend using the power of stories to develop websites. In this article, Daniele Catalanotto shares two examples showing how you can use Storytelling to enhance a website experiences. We’ve told you before that all of us humans are natural born storytellers. We tell stories all the time. We’ve been doing it since we were small kids. But as soon as we try to tell stories in a business context, we freeze. We try too hard and we end up doing a natural thing in an artificial way. Here are seven common mistakes in business storytelling you sure don’t want to make. It’s now commonly accepted that Storytelling isn’t only for writers. Marketers and brand experts also use it to enhance the brands they work on. In this article, Daniele Catalanotto shares three of our own projects that show how you can use storytelling to improve your branding. Most brands and companies love talking about their achievements and milestones. They usually don’t show failures and setbacks. It’s a pity. So brands, please hear this advice by our CEO Olivier Kennedy: don’t be shy and talk about your failures. That’s what will make your story authentic and interesting. In this article, we will discover together how you can apply the secret powers of storytelling to your presentations. And put your audience into excitement mode rather than sleep mode. Storytelling is one of the building blocks of modern marketing. This is clear for all. But storytelling can do more than that. At Enigma, we believe Storytelling is a building block also for innovation. We believe we can leverage Storytelling in most of the tools and frameworks we use. In this post, COO and Managing Partner Martin Künzi shows how Storytelling fits in the tools of the 21st century. Storytelling is a really rich topic. We have already covered many elements in our series about Storytelling here on our blog. For those who want to become masters of storytelling, I selected 5 key resources. These books, articles and tools will transform you in jedis of storytelling and storymaking. Storytelling in marketing is on everyone’s lips but not many companies are able to implement it at its fullest. In this article, COO and Managing Partner Martin Künzi shares his favorite example about a successful brand. Storytelling is one more buzzword in today’s marketing departments and companies. Everyone wants to be better at storytelling. In this article, Daniele Catalanotto helps you remember that storytelling is not a magic spell to solve all problems in marketing and communications.